ATCA radio intensity maps zoomed in at J1015 and the nebula G283.1−0.59 at 16, 6, and 3 cm. The 16 cm image is obtained from the off-pulse phase bins with the pulsar binning data. The crosses mark the pulsar positionand the beam sizes are shown in the lower left. Credit: Ng et al., 2017. (Phys.org)—Astronomers have recently identified a peculiar bubble-like structure associated with an energetic pulsar known as PSR J1015−5719. The newly found feature, designated G283.1−0.59, is most likely a polar wind nebula. The findings were presented June 9 in a paper published on the arXiv pre-print server. Located some 16,600 light years away from the Earth, PSR J1015−5719 is an energetic pulsar with a spin period of 0.14 seconds and an estimated age of about 39,000 years. The pulsar was detected in 2003 by the Parkes Multibeam Pulsar Survey. Although PSR J1015−5719 is located near the gamma-ray source 3EG J1014−5705, so far no pulsed or persistent gamma-ray emission has been found at the pulsar position. Therefore, the possibility of association with this source was excluded by researchers. Moreover, follow-up infrared, optical, and X-ray observations also found no counterparts to this pulsar. Now, a team of astronomers led by C.-Y. Ng of the University of Hong Kong presents the results of new radio observations of PSR J1015−5719, which reveal an interesting structure associated with this pulsar. The observational campaign was conducted using the Molonglo Observatory Synthesis Telescope (MOST) and the Australia Telescope Compact Array (ATCA), both located in Australia. The new data allowed the researchers to reveal a nebula consisting of a diffuse head, a circular bubble, and a collimated tail. 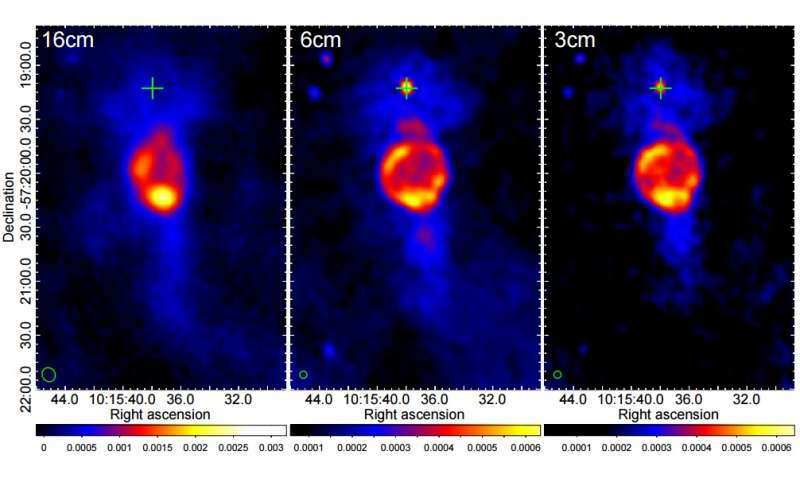 "We report the discovery of a synchrotron nebula, G283.1−0.59, associated with PSR J1015−5719. Radio observations using the Molonglo Observatory Synthesis Telescope and the Australia Telescope Compact Array at 36, 16, 6, and 3 cm reveal a complex morphology. The pulsar is embedded in the 'head' of the nebula with fan-shaped diffuse emission. This is connected to a circular bubble of 20″ radius and a collimated tail extending over 1'," the scientists wrote in the paper. According to the authors of the study, G283.1−0.59 is most likely a bow-shock pulsar wind nebula (PWN). PWNe are characterized by broadband synchrotron radiation from radio to X-ray bands when they are formed as a result of interaction of pulsar wind with the ambient medium. The morphology of bow-shock PWNe includes a long collimated tail with a small bow-shock standoff distance. The team revealed that morphology of G283.1−0.59's head resembles the shape of a classical bow shock. The results also suggest a projected stand-off distance of about 20″. Therefore, the researchers argue that the morphology of the newly discovered nebula is similar to that of other PWNe. The hypothesis that G283.1−0.59 is associated with and thus powered by PSR J1015−5719 is based on the fact that the nebula is very close in projection to the pulsar. "We suggest that this is a newly identified bow-shock PWN associated with J1015. (...) Given its peculiar properties, a chance coincidence seems very unlikely," the paper reads. The astronomers concluded that G283.1−0.59 is an interesting rare example of a slow moving bow-shock PWN, in which the pulsar spin axis misaligns with the proper motion direction. We report the discovery of a synchrotron nebula, G283.1-0.59, associated with PSR J1015-5719. Radio observations using the Molonglo Observatory Synthesis Telescope and the Australia Telescope Compact Array at 36, 16, 6, and 3 cm reveal a complex morphology. The pulsar is embedded in the "head" of the nebula with fan-shaped diffuse emission. This is connected to a circular bubble of 20" radius and a collimated tail extending over 1'. Polarization measurements show a highly ordered magnetic field in the nebula. It wraps around the edge of the head and shows an azimuthal configuration near the pulsar, then switches direction quasi-periodically near the bubble and in the tail. Together with the flat radio spectrum observed, we suggest that this system is most plausibly a pulsar wind nebula (PWN), with the head as a bow shock that has a low Mach number and the bubble as a shell expanding in a dense environment. The bubble could act as a magnetic bottle trapping the relativistic particles. A comparison with other bow-shock PWNe with higher Mach numbers shows similar structure and B-field geometry, implying that pulsar velocity may not be the most critical factor in determining the properties of these systems. We also derive analytic expressions for the projected standoff distance and shape of an inclined bow shock. It is found that the projected distance is always larger than the true distance in three dimensions. On the other hand, the projected shape is not sensitive to the inclination after rescaling with the projected standoff distance.